Has the Avengers board game revealed the movie's enemy soldiers? There's been a lot of speculation about the monstrous soldiers that appear in the latest Avengers trailer. Are they Frost Giants? Skrulls? Something else? Well, new photos from the Avengers strategy game may have the answer. 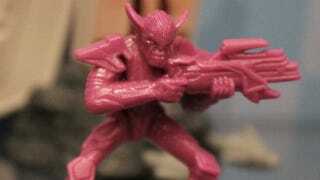 At Toy Fair, MTV Geek got a close look at the new game, and noticed these little pink devils all over the display, and they look a lot like the shapeshifting alien Skrulls. Now, the appearance of the Skrulls would contradict producer Kevin Feige's statement that Skrulls won't appear in the film, although some have speculated that the Avengers' foe will be a Skrull-like alien, such as the Ultimates universe's Chitauri, to ensure that Marvel dodges Skrull-related legal issues with Fox. Of course, it's entirely possible that the strategy game isn't closely related to the movie, but these markers do bear a resemblance to the screencaps we saw in the Avengers trailer. So does this mean we'll be seeing Skrulls — or at least Skrullish creatures — in the movie?